The dazzling array of radiant effects transmitted by the simple common colour red. 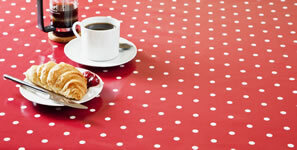 is here for all to see with this our range of red tablecloths. Rich buoyancy is instantly communicated in each one of these designs, and we have striped, checkered, floral and plain varieties, each creating stunningly influential portraits of red. Why not try a sample in your own surroundings to check out the contrast of effects that can be achieved? For instance you could compare one particular attractive tablecloth red and white gingham PVC with the paisley raspberry red variety as you will see both have the colour red as their central theme, but it results in vastly different finishes.